Tourist information and guide to hotels, apart hotels in Santa Ponsa – Book cheap Santa Ponsa hotels, Santa Ponsa holidays, Majorca. Santa Ponsa hotels offer the most quality service and party time all year round for the holidaymakers. Below you may find the Santa Ponsa hotels for your Santa Ponsa holidays in Majorca. 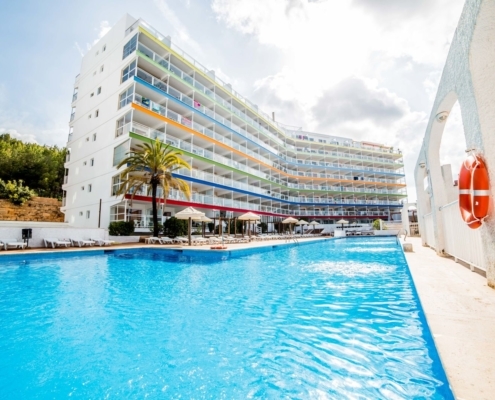 Suneoclub Globales Santa Ponsa is an all-inclusive hotel in Santa Ponsa. It is a family-friendly beach hotel located at Majorca, Spain. 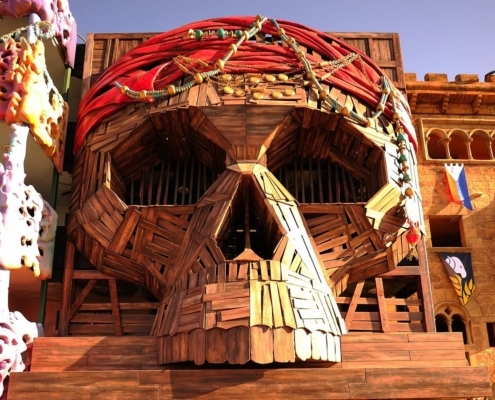 Located just 400 meters from the breathtaking sandy beaches, the Pirates Village Santa Ponsa resort is an extraordinary pirate-themed hotel in Santa Ponsa, Mallorca, Spain. Are you travelling to Mallorca, Spain for your Santa Ponsa holidays? Are you looking for a hotel in Santa Ponsa to cater to your accommodation needs? 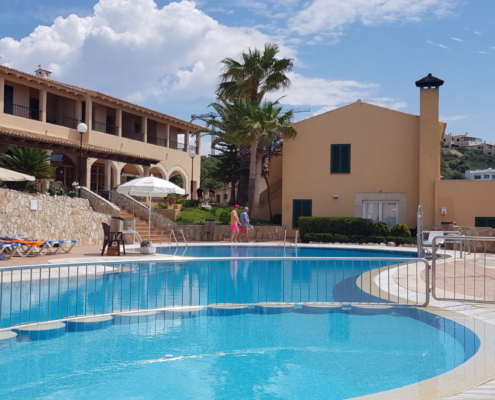 Hotel Miranda Santa Ponsa is a simple family-run establishment situated in a serene residential area near the Santa Ponsa resort. The refurbished Senses Hotel Santa Ponsa consists of three buildings facing each other in one of the quietest locations in Central Santa Ponsa. 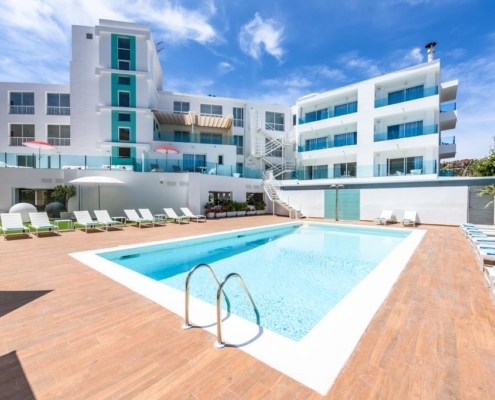 Hotel Sky Senses - Former "Delfin Mar"
Part of the Delfin Group of hotels, the 4 star Hotel Delfin Mar is situated around 160 metres from the beach, in the popular resort of Santa Ponsa on the south west coast of Majorca. https://santaponsainfo.com/wp-content/uploads/2018/10/hotel-sky-senses-former-delfin-mar-01.jpg 900 1272 HITFighter https://santaponsainfo.com/wp-content/uploads/2019/02/santa-ponsa-logo.png HITFighter2018-10-15 17:39:042019-02-04 09:55:24Hotel Sky Senses - Former "Delfin Mar"
Formally a private residence, the 2 star Hotel Bon Repos is a small family run hotel that is situated around 150 metres from the beach in the popular resort of Santa Ponsa on the south west coast of Majorca. Deya Hotel is situated in the centre of Santa Ponsa, just a short walk from the tranquil beach. 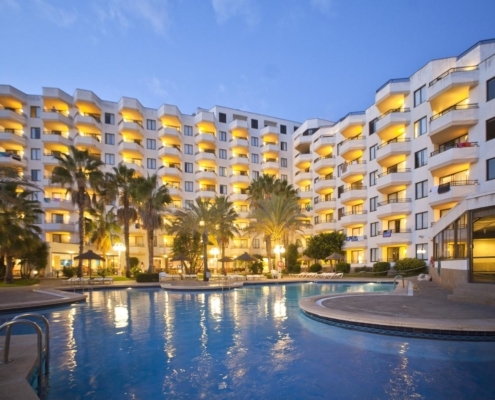 Close by guests will find a variety of restaurants, shops, clubs and the resorts nightlife. The TRH Jardin del Mar Apart Hotel complex boasts stunning views over the beautiful bay of Santa Ponsa, thus providing an idyllic spot for a relaxing getaway. Fergus Cala Blanca Suites Hotel is ideally situated next to Santa Ponsa Bay in Mallorca, overlooking the beautiful, sandy Cala Blanca beach. The Bahia del Sol Hotel is situated only 200 metres from the beach in Santa Ponsa. Made up of two buildings, the hotel offers a number of well equipped and comfortable bedrooms. This is a hotel which endeavours to meet the needs of families and couples looking for a fun packed holiday in a tranquil setting. 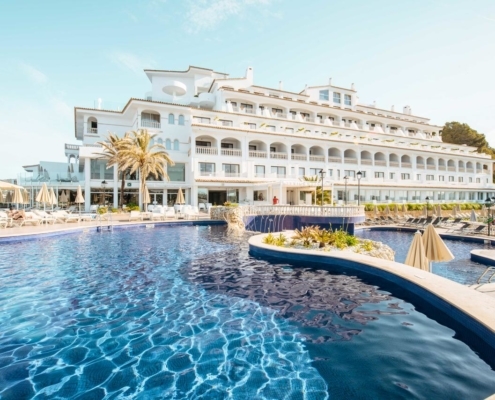 SENTIDO Punta del Mar's location on a peaceful headland means you'll have beautiful sea views and a quiet backdrop for an adults-only, escapist holiday. A friendly atmosphere, high standards, great location and varied facilities make the Viva Rey Don Jaime an ideal place to stay, for couples and friends. Its modern interiors provide a great backdrop for your holiday. Some of the most stunning bay views you could ever wish for are waiting for you at the IBEROSTAR Jardin del Sol, especially from the fantastic pool. Santa Ponsa is located in Majorca. Majorca or Mallorca is the largest island in Spain. Located along the Mediterranean Sea from the Balearic Islands archipelago. Palma is the capital of a famous tourist destination such as the other Balearic Islands such as Menorca, Formentera and Ibiza. As a result, these hotels, offer affordable and memorable packages for your holidays in Santa Ponsa. The wealth of free time, without the usual day-to-day tasks and constraints, make holidays the perfect time to indulge in hobbies and pastimes. Some may take the chance to visit producers of local artwork, and many will satisfy their taste buds with a visit to a vineyard or a high-quality restaurant. Santa ponsa hotels are of top-class, several owning prestigious Michelin stars. There are plenty of people willing to dine at these places, with Santa Ponsa hotels having attracted many wealthy, and famous, people to purchase properties on the island. Some of the award-winning restaurants are based in hotel complexes such as the Plat D’Or which can be found in the Sheraton Mallorca – Arabella Golf Hotel near Son Vida to the west of the Palma suburbs. Another one is situated in the pretty streets of Deia, one of the most attractive towns on Mallorca. Also located on the island is one of the finest santa ponsa hotels known as Puerto Pollenca located on the northern side, and Bar Restaurant Tolo’s creates what some describe as the best pizzas on Santa Ponsa. The establishment is certainly well run, has welcoming staff and an excellent position right on the beach-front of this attractive resort. Mallorca not only has a great choice of restaurants but is also building up a reputation as a well-respected wine producer. It is the island’s „terroir“ or in layman’s terms, the quality of the earth where vines are grown, that makes the vineyards on Mallorca more interesting to wine buffs. Wine producers are always looking for new locations that can offer ideal conditions for the crops they want to grow. Southern England has seen Champagne producers investing in certain areas that have almost identical weather and soil conditions to the famous countryside around Reims. They may not be able to call their production Champagne, but because they use the same production techniques, with state-of-the-art equipment, some English producers are gaining many awards for their sparkling wines. The native grape varieties grown on Mallorca include all the main popular names like Merlot, Syrah, Chardonnay, but some less well-known varieties fare better and produce great wines nonetheless. More local varieties include Prensal Blanc and, for red wines, Mantonegro and Callet. There are now said to be other 300 different wines produced on Mallorca with vineyards like the Jaume Mesquida winery and the Son Prim family winery in Sencelles both well known. The Bodegas Can Ribas near Consell offers the opportunity for visitors to come and see how the wines are made and sample the new vintages. So indulge your test buds in some upmarket experiences when you next take a trip over to Mallorca. Flights to the island are very favourably priced so contribute some of those savings towards a memorable meal to remind you of your stay. Business or leisure travellers can enjoy Santa Ponsa. Apart from the full range of infrastructure, there is a majestic Mediterranean resort to relax. They also have natural parks, recreation centres and natural caves. Santa Ponsa hotels are so affordable, and one will enjoy their stay like the Manor Houses. However, if you are staying in a hotel, you can easily book yourself to unforgettable tours through the natural, artistic and historical heritage of the archipelago. Budget hotels in Santa Ponsa, Mallorca. Almudaina – This is one of the finest Santa Ponsa hotels. The comfortable 3-star Santa Ponsa hotel is located in the cultural centre of Palma de Mallorca, close to the Waterfront, Port and Palma de Mallorca Cathedral. It offers 77 spacious and well-lit rooms with en-suite bathrooms, air conditioning, TVs and internet access. Other facilities include a lounge area, a cafeteria, a restaurant, a bar and a 24-hour front desk. Hotel Palladium – This is one of the 3-star hotels in Santa Ponsa that you will love. 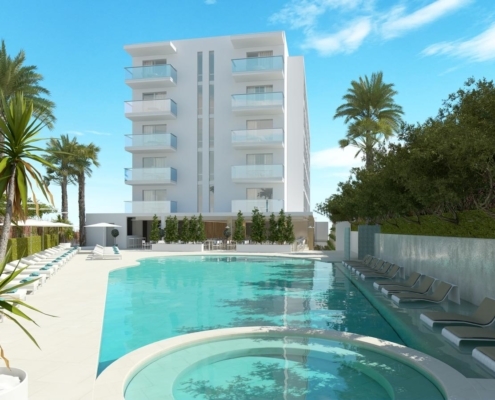 It has a central location in beautiful Palma de Mallorca. It is also close to the bus route to the airport. 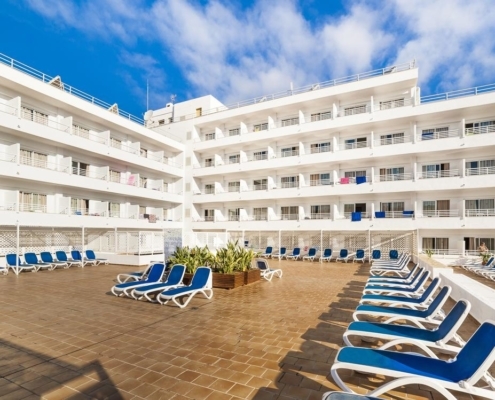 Santa ponsa hotels 4 star include Palladium hotel which has 53 well-equipped rooms and a coffee shop. It also has a bar, a 24-hour front desk and free Wi-Fi. They have a spacious space of parking, and this means you will not have to worry about where you will keep your vehicle. 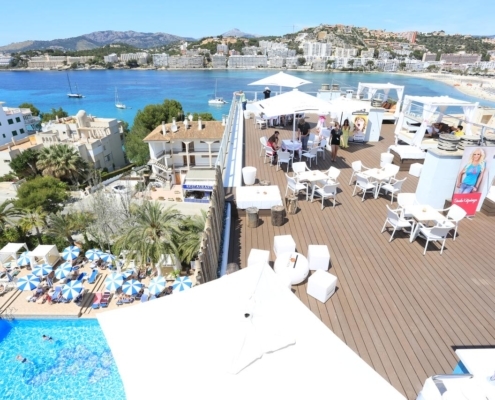 Hotel Mirador – This 4-star hotel in Palma de Mallorca offers stunning views of the marina from its panoramic terraces. It features a pool, bar, à la carte restaurant, fitness centre, sauna, solarium, tour desk and business centre. The 87 rooms include air-conditioning units, marble-floored rooms, a safety deposit box and Wi-Fi internet access. 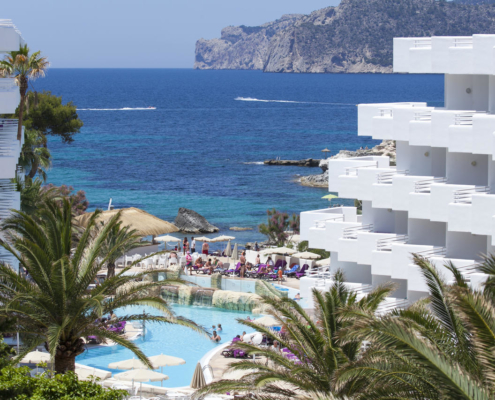 Isla Mallorca and Spa – It is one of the most incredible santa ponsa hotels. This is one of the four-star luxury hotels in Santa Ponsa, Mallorca, but it is in Plaza Almirante Churruca. It is very close to the city centre – provides good facilities, tranquillity and comfort. It is also more famous than other hotels in its class, especially because of its diverse leisure services such as the wellness centre and modern spa. 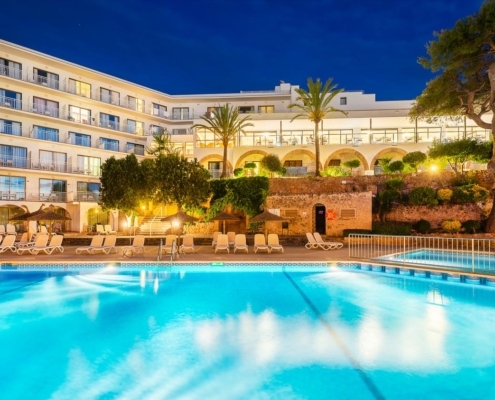 This cheap Santa Ponsa, Mallorca hotel has 159 spacious rooms with air conditioning and wireless internet access. Other amenities include non-smoking rooms, a bar, a restaurant, a solarium, an outdoor swimming pool, a sauna, a business centre and currency exchange services. Private parking is offered to guests for only € 10 per day.